Why Fruit Should Not Consumed with Milk? Do you you like to mix milk and fruit? so much variation in fruit soup in which there are a mixture of milk, sugar syrup and various kinds of fruits such as strawberry, apple, dragon fruit, coconut, melon etc..
Then I was googling to find out more. Apparently there is a ban on mixing several types of fruit and dairy based diet by combining foods by type. An American doctor named William Howard Hay became famous for successfully applying the principles of this diet to the patient to cure the disease. Because of the success principles of Food Combining diet doctor Hay is widely used as a reference by practitioners and nutritionists, one by Jan Dries, who has written books on nutrition and its application to health. One of the books I read was The Complete Book of Food Combining: A New Approach to the Hay Diet and Healthy Eating (1998). Protein: meat, fish, poultry, dairy and meat, nuts and seeds. Fats: oils, egg yolks, butter, cream, avocado. Sugar: the simple carbohydrates such as sugar, honey, fruit. Starch: a complex carbohydrate such as cereal, bread, rice, potatoes, pasta, and vegetables rich in starch. 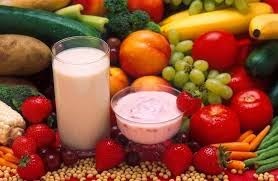 Acid: fruit, fruit vinegar, tomatoes, yogurt, butter milk, and vegetables. From the above diagram can be seen fruits that contain lots of bad acid combined with high milk protein. Acid will bind the protein so it would be difficult to digest. Even after I read further, I understand if new fruits should be eaten alone, not mixed with other foods. This is because fruits are generally acidic (low pH), which can cause fermentation in the stomach. Examples of fruits that are acidic, among others, strawberries, grapes and pineapple. This fruit can still be eaten along with the fruit that is slightly acidic (sub-acid) such as apples and peaches, but should not be eaten together with fruits that are sweet like bananas and dates fruit. And I just knew that if the melon is the food most quickly absorbed by the body than other foods. Therefore, do not eat the melon along with other foods, including other fruits, because it will cause digestive problems. May this article useful to you.